A Modeller will invite children to call out suggestions for making particular figures or things. Giraffes, cars, trees, giant hats - you name it, the Modeller can make it. Their performance includes jokes, games and puzzles, together with background music and sing-a-long stories, so there's always plenty to keep the children happily and safely entertained. All Modellers are used to dealing with children in a professional capacity and know how to create a sense of focus during their act, which lasts about an hour or so. If you are hiring a Balloon Modeller, they will be pleased to share their testimonials, reviews and CRB checks. Children love playing with balloons - the gorgeous colours and squeaky sounds all make for fabulous fun - so plan a party that goes with bang and get a Balloon Modeller on board for your event! Find a Balloon Modeller for hire near you in minutes! Option 1. Enter your event location below & contact a Balloon Modeller directly! Option 2. Request multiple quotes from available Balloon Modellers Get Quotes! Option 3. Read information & advice on hiring Balloon Modellers Read Advice! WANT TO KNOW MORE ABOUT balloon modellers? Read on for the most comprehensive guide to booking a Ballon Modeller, including how much a Balloon Modeller costs, exactly what they will do at your event, plus tips, advice and information to help make your event one to remember! A Balloon Modeller will twist hundreds of balloons into animals, balloon hats and cartoon characters at your event! What exactly will a Balloon modeller do at your event? A Balloon Modeller, otherwise known as a Balloonist, is an entertainer with a twist! A unique and novel performer that will charm your guests with tailored balloon elephants, frogs, dogs, butterflies, monkeys, giraffes and even aliens! A Balloon Modeller can even shake things up a bit and artfully model balloons on things like swords, pirate hats, and well known-Disney characters. Modelling balloons is innovative and creative. They can be basically shaped into anything, so we’re sure that most Balloonists are a dab-hand when taking in requests from the crowd! Hiring a Balloon Artist is a fun way to entertain your guests at any celebration. Mainly, a Balloon Modeller will entertain your audience with a fantastic service that will put the wow factor into celebrations and impress your guests, whatever their entertainment tastes may be. What event types are balloon modellers hired for? What can make your child’s birthday that extra bit special? Book a Balloon Modeller! Balloons are universally loved by children and adults the world over, so booking a Balloonist as a child’s birthday entertainment would be ideal. A queue would form from the back of the function room all the way to the Balloonists table where they will display their most complex and celebrated Balloon pieces which will surely include; spiders, rabbits, flowers, hearts and much, much more. 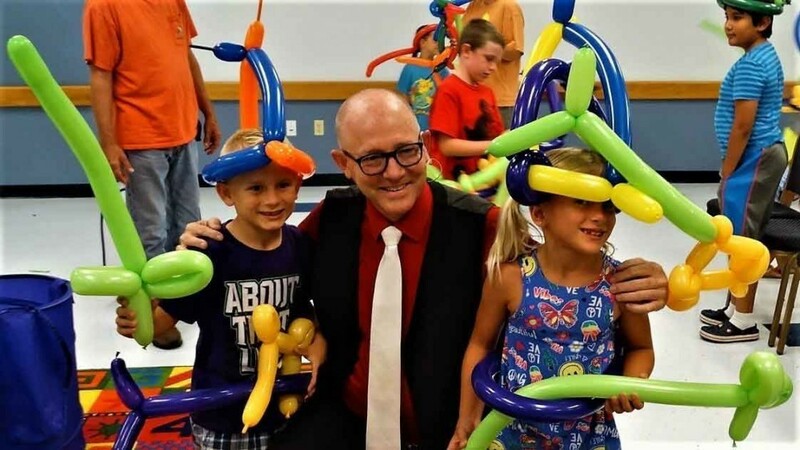 As an additional service, most Balloon Modellers also include a Balloon dress-up option, where they will add balloon shapes to a child’s costume such as balloon hats and balloon wings to really boost their imaginations! The children can then take a balloon home from the party where it should last a good 2-3 days, making it a great reminder of the party fun! Balloon artists will have a few different hire options that you can choose from. For example, you may want a Balloonist to be stationary for a few hours, set up at a table whilst making balloon requests, or maybe you would like to hire a Balloon Modeller to walk around your venue, table to table, offering a selection of balloon characters. It’s worth noting that a professional Balloonist is an all round children's entertainer, and as well as skilfully moulding balloons, they will incorporate comedy, banter and a general cheeky repertoire to the mix. Some Balloonists also offer additional services such as face painting and general arts and crafts. If this is not offered on the bio of the Balloonist, then it may be worth using our messaging service to enquire with them personally. The wedding drinks reception is a time when you may need to hire some form of entertainment to keep all the kids (and big kids!) entertained and happy whilst proceedings such as the wedding photo's are taking place. Hiring a Balloonist to pull some shapes is a fantastic way to do this! Once the bride and groom have welcomed all of the friends and family into the main dining hall, and the speeches are about to start, it may be a good idea to hire a Balloonist to make some Balloon shapes with the children! They’ll be no more children complaining of boredom or causing chaos whilst this special moment is happening! So, maybe you have hired a live wedding band to keep the adults dancing until the early hours of the wedding evening reception, but what about the children? When you hire a Balloon Modeller, you will get a table set up in the corner of the hall, where an orderly queue of excited children will be, all awaiting their tailored balloon! A Balloon Modeller is great entertainment for corporate events such as a trade show, or as a shopping centre feature, or maybe you need to book some children’s entertainment for a fair or a school fate? A Balloonist is the perfect entertainer to hire as balloons are consistantly popular. They also hold a wonderful, nostalgic place in the hearts of adults so don’t think that balloons are just for children! If you’re aiming to hire some form of children’s entertainment for a product launch, then a Balloonist will attract a huge amount of attention that will, in the long run, be well worth the money! How much do Balloonists cost to hire? Our simple to use entertainment directory allows you to firstly search for the best Balloon Modellers who are local (or travel to your area) and then via the contact form you may contact them directly to enquire for a no obligation quote to perform at your event. Some acts will also add a rough price guide to their profile for your convenience. What are the usual set formats and performance lengths for balloon modellers? A Balloon Modeller can tailor their performance times to suit you and your event, however, on average a professional Balloon Modeller will entertain for 3/4 hour sets. This again, can be discussed via our messaging service. How much space will a balloon modeller need at your event? A Balloonist will need the space of a 6 foot table and possibly a wall to display pre-made balloon art, so really not that much room at all! What equipment and set up requirements do balloon modellers need? As with most artists who sign up on Entertainersworldwide.com, a Balloon Modeller will provide most of their own equipment. This will include all of the balloons needed and a small electric/manual balloon pump system. You may want to enquire if an artist needs a PA to amplify their sound, in which case we would advise to use our easy to use messaging service to find out. We do ask that each performer gets a backstage area in which they can prepare for the performance ahead. If your venue does not have a backstage area, then we kindly ask that you enquire with the venue to seek an alternative space in which the performer can comfortably get ready to entertain. How can you find and book a balloon modeller with Entertainersworldwide.com? WANT TO RECEIVE A RANGE OF QUOTES FROM Balloon Modellers?